Sarah Nader- snader@shawmedia.com Cary-Grove's Jimmy Freskos misses the catch during the fourth quarter of Saturday's second-round Class 6A football playoff game against Boylan November 9, 2013. Cary-Grove was lost, 10-17. Sarah Nader- snader@shawmedia.com Cary-Groves quarterback Jason Gregoire (lef) is tackled by Boylan's Quinn Stnovmski during the second quarter of Saturday's second-round Class 6A football playoff game in Cary November 9, 2013. Cary-Grove was lost, 10-17. 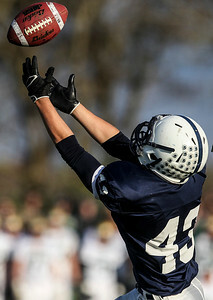 Sarah Nader- snader@shawmedia.com Cary-Grove's George Hartke catches at pass during the third quarter of Saturday's second-round Class 6A football playoff game against Boylan November 9, 2013. Cary-Grove was lost, 10-17. Sarah Nader- snader@shawmedia.com Cary-Grove's Tyler Pennington runs a play during the second quarter of Saturday's second-round Class 6A football playoff game against Boylan November 9, 2013. Cary-Grove was lost, 10-17. Sarah Nader- snader@shawmedia.com Boylan's Ian Riggs (left) is tackled by Cary-Grove's Travis Myerson during the second quarter Saturday's second-round Class 6A football playoff game in Cary November 9, 2013. Cary-Grove was lost, 10-17. Sarah Nader- snader@shawmedia.com Cary-Grove's Matt Sutherland runs a play during the first quarter of Saturday's second-round Class 6A football playoff game against Boylan November 9, 2013. Cary-Grove was lost, 10-17. Sarah Nader- snader@shawmedia.com Cary-Grove's Zach McQuade fumbles the ball during the third quarter of Saturday's second-round Class 6A football playoff game against Boylan November 9, 2013. Cary-Grove was lost, 10-17. 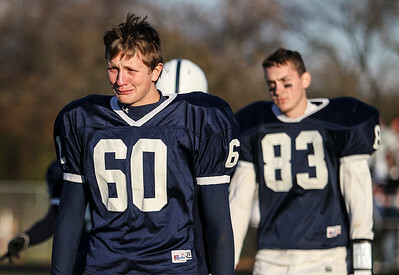 Sarah Nader- snader@shawmedia.com Cary-Grove's Chris Ruelle walks off the field after Saturday's second-round Class 6A football playoff game against Boylan November 9, 2013. Cary-Grove was lost, 10-17. Sarah Nader- snader@shawmedia.com Cary-Grove's Matt Sutherland (left) and Emerson Kersten walk off the field after Saturday's second-round Class 6A football playoff game against Boylan November 9, 2013. Cary-Grove was lost, 10-17. 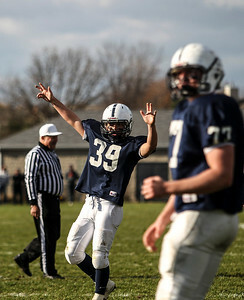 Sarah Nader- snader@shawmedia.com Cary-Grove's Tyler Pennington celebrates during Saturday's second-round Class 6A football playoff game against Boylan November 9, 2013. Cary-Grove was lost, 10-17. Sarah Nader- snader@shawmedia.com Cary-Grove cheerleaders cheer on the football team during Saturday's second-round Class 6A football playoff game against Boylan November 9, 2013. Cary-Grove was lost, 10-17. Sarah Nader- snader@shawmedia.com Cary-Grove's Tyler Pennington runs on the field before Saturday's second-round Class 6A football playoff game against Boylan November 9, 2013. Cary-Grove was lost, 10-17. Sarah Nader- snader@shawmedia.com Cary-Grove cheerleaders perform during half time of Saturday's second-round Class 6A football playoff game against Boylan on November 9, 2013. Cary-Grove was lost, 10-17. 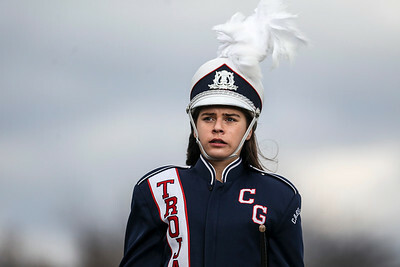 Sarah Nader- snader@shawmedia.com The Cary-Grove marching band performs during Saturday's second-round Class 6A football playoff game against Boylan November 9, 2013. Cary-Grove was lost, 10-17. 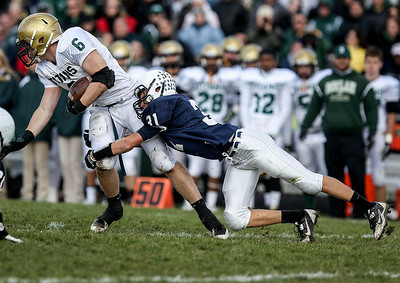 Boylan's Ian Riggs (left) is tackled by Cary-Grove's Travis Myerson during the second quarter Saturday's second-round Class 6A football playoff game in Cary November 9, 2013. Cary-Grove was lost, 10-17.